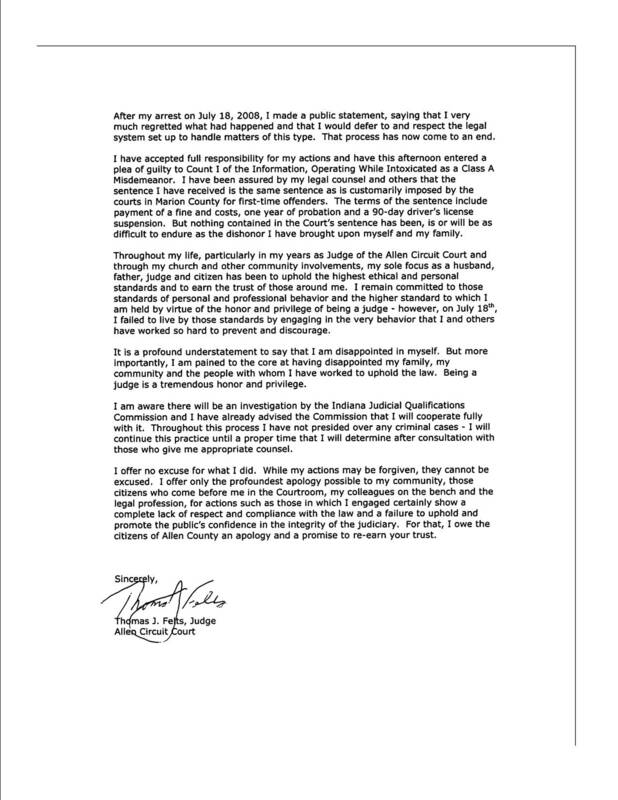 Fort Wayne Observed: Judge Felts: "I failed to live to those standards"
Judge Felts: "I failed to live to those standards"
Allen County Circuit Court Judge Thomas Felts and the Marion County Prosecutor's Office have reached a plea agreement regarding drunk driving charges in Indianapolis. You can download the plea agreement here. You may read his statement below or download it here as a PDF. Well stated Judge Felts. You did the right thing and that makes a good Judge. That is one of the greatest apologies I have ever read/heard/seen by an elected official. Not one of us are perfect, and while I'll let the IJQC make the judgment on his future, I have to say I would be thoroughly satisfied with the apology. We can all hope that when any of us makes a mistake that we have half the class in addressing it that Judge Felts is demonstrating. How come Judge Felts gets away with a 90 day suspension? Why not the full year like he is supposed to get for refusing a breathalyzer? Just another slap in the face by our court system. We should be used to it by now. What about the apology for poisoning thousands of Allen County citizens? Oh, I forgot no one cares about that. This town is going to burn old testiment style. The link to the plea agreement no longer works. Wouldn't it be nice if we could all just apologize for our mistakes and not pay any penalties. Imagine how empty our prisons would be. Ed. note: There was a mistake in uploading the wrong file. FWOb won't have access to the PDF file until next week in order to place the correct file for availability. Nice apology, now he just needs to resign and I will forgive him.